The Illinois Railway Museum’s Main Street Entrance Building is our next step into the future. 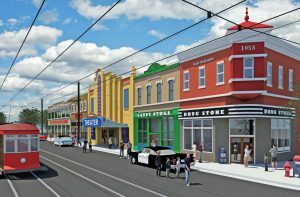 The Illinois Railway Museum is proud to announce the completion of the planning phase for its circa 1958 Midwest Main Street scene. Fundraising for the centerpiece structure has officially commenced and sponsorship opportunities are available. The Entrance Building will be a two-story structure with 36,000 square feet of space featuring dedicated permanent and revolving exhibits, lecture and film presentation halls, educational learning centers, archival storage, offices, and expanded public facilities. The proposed building will provide the necessary facilities to share our historic collection with the public and to provide the finest in educational treatments. It will include exhibit space, video displays, interpretive movies, lecture rooms, and educational learning centers. We need your assistance to turn this vision into reality.